An Interview with C. Brian Williams, founder of Step Afrika! Step Afrika! is the first professional dance company dedicated to the tradition of stepping. Here, founder C. Brian Williams shares the history of the company and how he helped evolve stepping from a traditional form primarily practiced in African American fraternities and sororities to an internationally touring repertoire. Can you tell me a little about the history of Step Afrika!? This year, Step Afrika! celebrates its 25th anniversary. When we first started in December 1994, Step Afrika! was launched to be a cultural festival in Johannesburg, South Africa. The idea for the festival actually came to me three years earlier in 1991 while I was living and working in southern Africa. As you can imagine, this was a very interesting time in South Africa; Nelson Mandela had been released from prison, but the damaging effects and laws of apartheid were still controlling the country. Because of this history, South African arts forms weren’t really understood or known that well in America. Cultural exchange had been restricted. I first saw the South African gumboot dance–a percussive dance created by miners wearing heavy rubber boots – in Maseru, Lesotho. The dance had striking similarities to the African American tradition of stepping and immediately sparked my curiosity: What is this tradition that is also a body-percussive dance? Gumboot and stepping are both forms with no musical accompaniment, where the dance and music happen at the same time, like tap or Irish step dancing. My personal discovery of the gumboot dance was also during an interesting time in stepping’s development in the United States. Stepping is a ritualistic and folkloric dance whose gestation is owed to the African American fraternity and sorority system. In fact, the only way to learn how to step prior to 1990 was by becoming a member of these organizations. You couldn’t just take a class at your local studio and learn how to step. My first introduction to stepping was as a student at Howard University but I did not learn how to perform the tradition until I pledged my fraternity, Alpha Phi Alpha Fraternity, Inc-Beta Chapter, in the Winter/Spring of 1989. Once I graduated college and moved to South Africa in 1991, I came across the gumboot dance and asked: Why haven’t I heard of this art form? I wanted to connect the two forms, and, as a result, hopefully connect the people who practice them. The idea with Step Afrika! was to create a platform for the sharing of two similar cultural traditions. We held the first festival in 1994 in Johannesburg, six months after President Nelson Mandela was elected. It was an exciting time; freedom and democracy had finally come to South Africa and you could feel the transformation in the air. 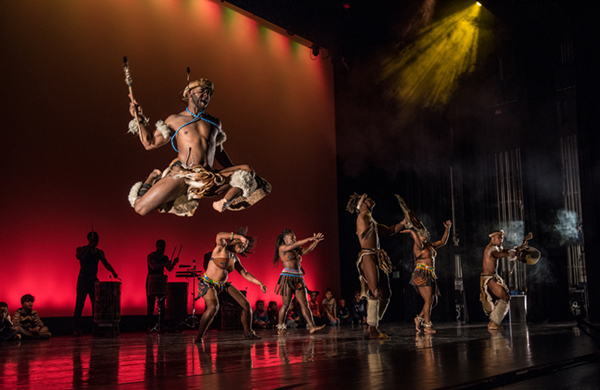 We – an historic partnership of South African and American students and artists – were celebrating this momentous occasion with an arts festival, the Step Afrika! International Cultural Festival, based on artistic exploration, cultural exchange and youth development. That was the focus of Step Afrika! for the first couple years. It was a festival in Johannesburg, not a dance company. Interesting thing is, I was basically a traditional “dancer” tied to a community practice, but the artists we partnered with in Johannesburg were highly trained, professional dancers. We were bringing frat guys into a dance studio for the first time to collaborate with artists who rehearse and do warm ups. As a traditional fraternity “stepper” in 1989, I never warmed up! It was an intriguing transition for this folkloric form that my fraternity brothers loved and practiced but didn’t consider a professional dance form. From what has been documented around the art form of stepping, this would be one of the first times that stepping had entered the dance studio. After a couple years leading the Step Afrika! festival, I began to ask: Is there something more we could do with this? Around 1996, I began to play with the idea of performing and teaching young students not only in South Africa, but in the United States. That began the slow transition of Step Afrika! from a cultural exchange festival into a dance company. How would you describe the company’s choreography to someone who hasn’t seen a show? Step Afrika! is the first professional company in the world dedicated to the art form of stepping, and the company has been at the forefront of introducing stepping to the “theater” and the performing arts world in general. Stepping is a uniquely American form. 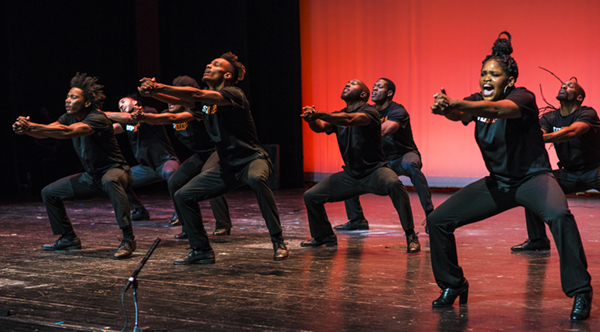 We define stepping as a polyrhythmic, percussive dance form created by African American fraternities and sororities, and our work has focused on both preservation and innovation of the movement practice. However, since we are rooted in artistic and cultural exchange with the people of South Africa, South African dance forms play a big role, like the gumboot dance or the dance of the Zulu people, in our work as well. Over our 25-year history, we’ve created works that demonstrate what we consider to be stepping’s unlimited artistic possibility. 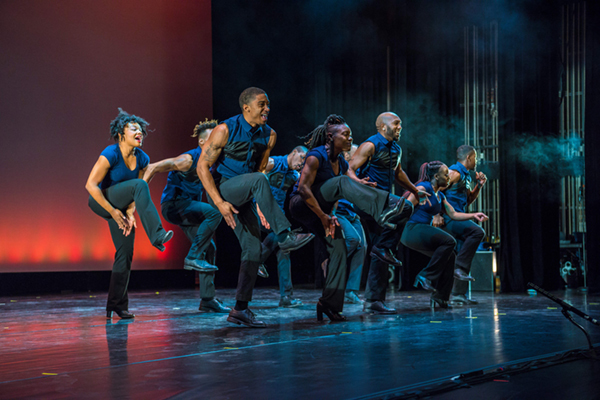 We have merged stepping with the African-American spiritual; performed stepping to many musical genres including classical, jazz, and hip hop; and we have incorporated elements of other movement practices like tap, West African, modern and contemporary. Most recently, we merged stepping with the visual arts world in The Migration: Reflections on Jacob Lawrence. This work travelled across the country and was Step Afrika!’s first introduction to Broadway’s legendary Theater District. We performed more than 25 shows in three weeks, all completely sold out, and this was stepping’s first true introduction to Broadway. Since then, others have started to employ the tradition. Can you share more about the educational component of Step Afrika!? Educational programs are a huge part of our work and it’s been part and parcel of Step Afrika! since the very beginning. Lots of people in the arts work with young people, but oftentimes its secondary to their performance “agenda.” For us, arts education is at the core. We’ve created lots of different programs to inspire and engage young people. Each year, we serve over 20,000 young people in our hometown of Washington, DC, with in-school performances, residencies and workshops, and that number doesn’t include the thousands more we serve on our annual tour of American theaters. We host residencies, like the Step Up to College residency program, where we teach stepping and its connections to higher learning in elementary, middle and high schools across the country. And we offer one-off workshops and masterclasses for students and professional dancers as well. But I’m most excited about our one-week summer camp, Summer Steps with Step Afrika!, that we created 11 or 12 years ago. It’s our flagship arts education program. Step Afrika! is now one of the largest African American dance companies; we have 14 full-time dancers on an 11-month contract, which is very rare in the dance field. Although we work with children almost every day throughout the year, the summer camp is the week we drop everything else and exclusively focus on developing the skills of the next generation. We get about 150 to 170 kids of all ages, and they come from all over the country. We’ve watched children start the program in 3rd or 4th grade and continue stepping with Step Afrika! all the way through high school and on to college. That particular journey of students through these vastly different stages of life has been wonderful to witness, and I am glad Step Afrika! has been a part of so many young people’s lives. When you go to create a new piece for the company’s repertoire, what is that choreographic process? Ninety five percent of our work is created internally, meaning in our own studios with our own dancers and our own choreographers. It’s very much a collaborative process. We always built work around the skills and capacities of the dancers in the company. We’ve also had to “develop” our own artistic directors. When we entered the field, we couldn’t hire a choreographer to come work with us. No one really knew what stepping was outside the college system. When I first learned stepping in my fraternity, I remember practicing every night at 10 p.m. after classes and study groups. 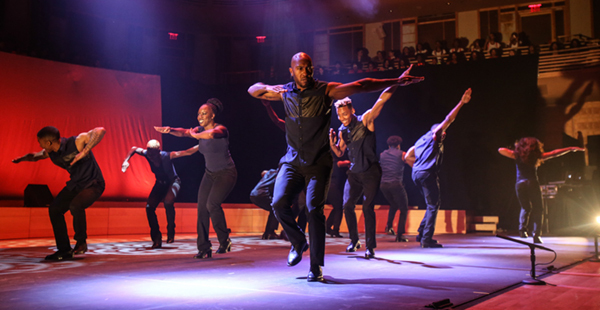 We would rehearse for two months to create a 10 to 12-minute show comprised of one to two-minute “steps” linked together by “step transitions.” These are the building blocks of the “step show” experience. Therefore, when I started Step Afrika!, all I had was a 10-minute show! The process of converting stepping from a 10-minute traditional format to a 90-minute feature length performance has been the real journey. There’s been lots of innovations along the way and I can truly say that Step Afrika! has helped to push the art form forward. A lot of people who see Step Afrika! for the first time don’t realize how much we’ve contributed to the development of the art form. We’re often in the position of introducing stepping to people versus discussing this 25+ year exploration of a movement style and the culture behind it. It’s been a process of creating space for an art form previously not seen on the professional stage and having the art form recognized and documented like never before. How have you seen the value and practice of stepping spread since Step Afrika! was founded 25 years ago? It’s been huge, but it is still growing. When I first started Step Afrika!, there was so much trepidation among presenters. Most of them didn’t even know what stepping is. What we’ve done is work to show the unique performance possibilities of stepping and bring something very different and unique about American culture and experience to audiences everywhere. So far, Step Afrika! has toured to more than 50 countries worldwide and, this spring, we will make our first visit to the Ukraine followed by a week of performances and workshops in Croatia. We also created an interactive exhibit on stepping in Washington, DC, at the National Museum of African American History and Culture. And when President Obama invited us to perform as a featured artist for the Black History Month reception, it was a huge moment for Step Afrika! and the tradition of stepping. Stepping is now considered its own unique art form that is deserving of these great arenas. How has stepping evolved as an art form over the past two to three decades? How about I talk about Step Afrika’s next production, called Drumfolk. I am incredibly excited about the creation of this work. Instead of looking forward at where stepping will go, we’re looking backward at the unanswered questions of how the art form even evolved to this point. As an art form, stepping is very under-researched. We can, for example, document the history of ballet; it’s been studied and aggressively archived. Same with modern dance. But stepping as an art form hasn’t been deeply explored. We know it comes out of the fraternity and sorority system, but we haven’t gone deeper into that. Which fraternities first started to step? Which colleges? When did it happen? One book, Soulstepping by Dr. Elizabeth Fine, starts the conversation but there is so much more work to be done. Our next production is looking back to support our looking forward. Why did African Americans employ body percussive forms like stepping? Why isn’t the drum a huge part of the culture? We want to get a sense of why African Americans chose to use the body as a drum. Our next production will investigate that and find answers to the development of stepping as an art form in America. I’m looking forward to really diving into that history. We’re giving ourselves a year of serious and concentrated activity to develop Drumfolk although the work is the result of 25 years of research and percussive practice. We’ve linked stepping with so many forms – African American spiritual, rock music, classical music, jazz music. This work will bring all that synergy as we dive into the origins. The challenge of being touring artists is to do the research within an aggressive touring schedule. But I appreciate the challenge; I love to be a working artist and create fulltime opportunities for other artists. That investment in our artists has allowed us to do so many fascinating things, and I hope it will allow us to do so much more in the future. Find information on upcoming shows at www.stepafrika.org/calendar/ and information on Step Afrika!’s 25th anniversary in Washington, DC, at www.stepafrika.org/performances/25thanniversaryhps/.